Dorset Street Flats cited in the history of New Zealand architecture. In 1953 the young Christchurch architect Miles Warren (b. 1929) had travelled to England, where he worked with the London County Council on the Roehampton Estate. He had begun architectural work in 1946, when at the age of sixteen he entered Cecil Wood’s office; this was followed by a period of study at the Auckland University School of Architecture, from which he graduated in 1950. In London he was, in his own words, “extraordinarily fortunate to be sitting right in the middle of the birth of Brutalism” and had the unique experience of of being shown over the Hunstanton School (1954), Norfolk, by it’s young architects, Peter and Alison Smithson. Scandinavian influences were prominent at the London County Council’s Department of Architecture at the time, and the Roehampton Estate was, as Nikolas Pevsner observed, Swedish in inspiration. Miles Warren travelled to Denmark and saw the work of the architect Finn Juhl, whose 1941-42 house at Ordrup has been widely illustrated in periodicals of the day. This house and other small-scale houses, provided the New Zealand architect with a model for the early Christchurch houses he built after coming back to New Zealand “brimful of ideas and determined to force them on an unsuspecting public”. He quickly realised that Group-style timber housing was unsuitable in the cooler Canterbury climate and so began to design flats and houses which had walls of white-painted concrete block. The first such building was the sequence of eight Dorset Street Flats (1956-57), which the architect has described as “simply a box of concrete block walls - with two full-height openings to the north and slots to the rear, and other solid boxes for the bathroom and wardrobe”. The block walls stop at door height and support fair-faced concrete beams; door and window detailing shows the depth of the concrete block; roofs are low pitched, timber framed and covered with corrugated iron, their eaves and verges set back to reveal the thickness of the walls. The Christchurch City Council engineers, unfamiliar with concrete block load-bearing walls, insisted on a frame of reinforced-concrete columns for the Dorset Street Flats, but later acknowledged that this was not necessary. The Christchurch public was as bemused by these flats as the Aucklanders who had dismissed the Group’s houses as barns or chicken coops. The first occupants had no difficulty in adapting to their compact and solidly built surroundings in which varnished rimu board ceilings contrasted warmly with the painted blocks, and foliage quickly softened the enclosing garden walls. Dorset Street Flats (1956-57), Merivale, Christchurch, by Miles Warren. Instead of having the usual timber frame or the steel-reinforced frame with masonry in-fill, these flats are merely concrete-block boxes. Initially they were regarded as fortress-like, yet today their structural method is widely used. 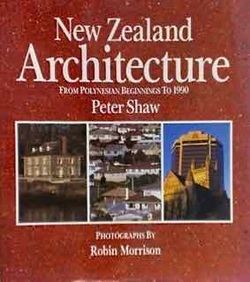 ​PETER SHAW, "New Zealand Architecture: From Polynesian Beginnings To 1990",1st Edition, Hodder Stoughton, 1992, ISBN 978-0340533208, p 160.